About a week ago, I had the pleasure to meet Olivia Heeney, British WYLD member and designer, following her invitation to her BA Design Degree Show held in London featuring her work titled — ‘Who would you be if you got dementia tomorrow?’. 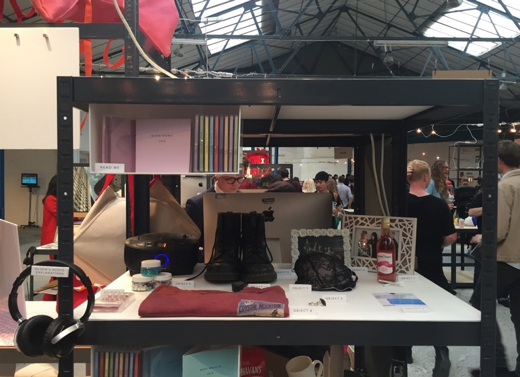 Here is a write-up sharing my experience and thoughts following my visit to her design show. 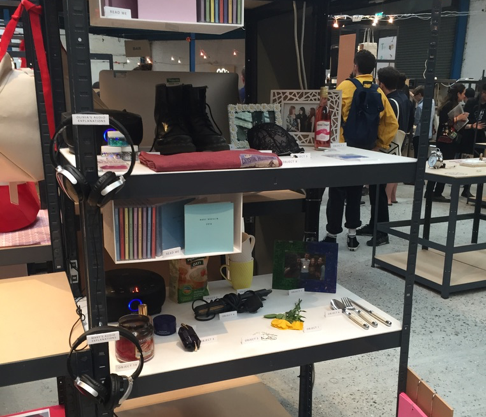 Olivia’s stand at the Graduation Show – her 10 objects on the top shelf, her aunt’s objects on the middle shelf, and her project and contact details on the bottom shelf. Olivia’s project was inspired by her observations while she was caring for her mum, who was diagnosed with early-onset dementia. She realised that people often talk about objects, interests or behaviours of people diagnosed with dementia in past tense: ‘She was used to…’, ‘He loved to…’ so she wondered how much it was contributing to depersonalised dementia care. It struck her to see how, for obvious reasons (lack of time, ease, etc…), people with dementia living in institutions all look a bit the same: dressed in clothes easy to put on / take off, no make-up or hair done… Although person-centered care is discussed a lot within the dementia community, it seems like care still focuses more on a person’ symptoms and behaviours than his/her comfort, communication and personality. Therefore, the aims of her projects were to retains personhood in individuals living with dementia, inspire people to prepare for and take ownership of their potential future lives with dementia, and to lessen the burden on carers to ‘guess’ at what would be important to their loved ones or what choices to make after dementia diminishes their communicative skills. Although her project was really well explained in the document she sent me, discussing it with her and seeing it during this show was enlightening for me… The concept is to create a record of the person’s important aspects of life and personality by asking them to choose 10 objects that best represent them. By doing this every year, you will them accumulate information on how people saw themselves during the different parts of their lives, what they loved, what they still love and it will definitely help knowing better their personality and what matters to them. ‘Our tastes and personality are likely to change over our lifetime’ before she said to me: ‘I don’t think I’ll still be into cigarettes, rosé and glitter at 50!’. Olivia’s 10 objects for 2018 (a bottle of rosé, cigarettes, a bra, pictures, glitter, DocMartens shoes, her pyjamas, a blanket, rings and make-up). 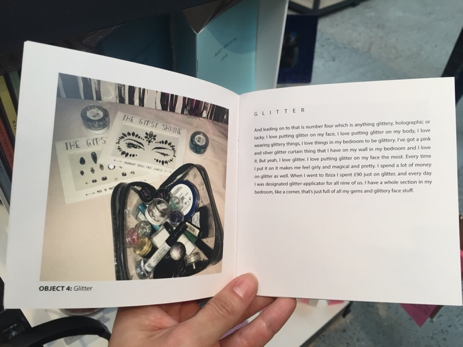 Those are recorded on two different formats: a booklet with pictures of each object and a text from the individual explaining why it is important to them or representative, and a CD on which you can listen to the individual explaining those same reasons. Olivia thought that having the individual’s voice recorded would make it even more personal and would be a good way for relatives to still be able to hear the voice of their loved ones talking about things that make them happy. I personally find her project really relevant. How many of us would like to have records of their relatives pasts indicating what was their life, who they were? Especially when we know that they will no longer be able to tell us those things at some point. I know I would! I would love to hear or know more about them but I would also consider doing it myself. It can tell us so much more about a person than photographs, on which we usually rely on… and obviously, it can be so helpful in personalising care during the illness, especially when communication gets difficult. Now she has graduated, Olivia is trying to push her project further. I know I wasn’t the only one she had invited during the show. The Alzheimer’s Society and Alzheimer Research UK were too! In the future, she would like to use her design skills to contribute to bigger things (dementia care but also any form of social contribution). I would like to thank Olivia for taking me way out of my comfort zone, as design is definitely something I have really poor knowledge on. I guess that’s also what WYLD is about: meeting young, motivated and inspired people working towards the same goal! If you would like to discover more about Olivia’s project, here the link to her website here. If you are a WYLD member and are interested to get in touch with her, feel free to reach out to her on SLACK.